On the 08/09/2008 the band moved from its old premises on Georges Street. The picture below captures the moment were the iconic Drogheda Brass Band sign which has become a familiar sight to motorists, both local and passing through, over the years was repainted. 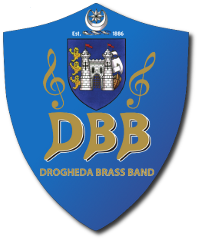 Drogheda Brass Band and guests Archie Hutchison, Alan and Claire Bourne welcomed a massive crowd of over 500 people to their free concert in the TLT on Sunday to finally celebrate the opening of their new bandrooms in Matthews Lane. Mayor of Drogheda Paul Bell was on hand to unveil the plaque, at the event which had been postponed because of snow from earlier this year, and family and friends of the members were treated to a rousing performance of pieces like Richard Rock's 'Dawn of New Age' and the ever-popular 'Riverdance' finale. The band, as ever, were under the baton of conductor Michael Maher, and a special mention was given to long-time member Tony Collins for being instrumental in organising the concert, Declan Walsh and the bandroom construction team and Tommy Leddy and the Leddy family, for the use of their theatre. However, many will agree that the younger members of the Music School stole the show with their delightful renditions of grade pieces on recorder, trumpet and coronet.
' We want to say a huge thank you to everybody who turned up on Sunday,' said a spokesperson. The concert and official opening of the bandrooms is the icing on the cake for the band, who are celebrating a remarkable fifth win in a row as Champion Brass Band of Ireland, and 125 years as a band. After the show, the only horn that was needed was a shoe-horn, as more than 300 people filled the spacious new bandrooms close to the TLT, and were treated to refreshments! After the crowds had left the band members watched a collection of videos put together by the bands Flugel Horn player Chris Cassidy. A photographic slideshow in memory of old comrades who played in our band in times past.This is one of six short visual pieces compiled for our new bandroom opening celebrations in 2011. The video also features the Band Committee and others who worked tirelessly to deliver a state of the art bandroom and home for our School of Music.